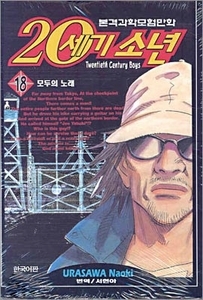 20th Century Boys is the story of Kenji as he fights to save the world against the mysterious "Friend." The story skips back and forth between the present day, 1999, and Kenji's childhood in the Sixties. "Friend" wants to take over the world using a plan that Kenji came up with as a child. The only thing that's worse is "Friend" is one of Kenji's childhood playmates. But which one? This is one compelling sci-fi mystery. The continuing debate over the identity of "Friend" as well as the mystery over what exactly will happen on New Years Day 2000 pulls you in and never lets go. The art is great, typical Naoki Urasawa. If you like 20th Century Boys for its mood, you might also like his previous work Monster.